In the aftermath of the failed suicide bombing attempt on a military facility by a female terrorist who blew herself up in Gombe recently, troops have arrested three suspected female terrorists who have been secretly recruiting ladies into the female wing of the terrorists group. 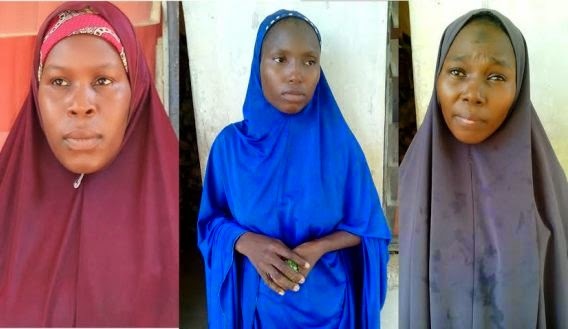 The suspects, Hafsat Usman Bako, Zainab Idris and Aisha Abubakar were intercepted while travelling to Madagali from where they were to transit to the forest to reunite with their cohorts. Investigations revealed that the suspects, led by Hafsat Bako, have the mission to recruit members into the female wing as well as conduct espionage for the group. Hafsat’s link with the terrorists group had earlier been a subject of investigation in 2012, when security agents on a manhunt for one Usman Bako, her husband who was identified as a terrorist, stormed their residence in Jimeta. This resulted in the discovery of an AK 47 rifle and 2 loaded magazines. Though Usman Bako later died in an encounter with troops in Sokoto where he had relocated to continue his terrorist activities, Hafsat continued with the terror group specializing in surreptitious recruitment of members into their fold. The arrested trio suspects were luring ladies especially widows and young girls by enticing them with male suitors who are mainly members of their terror group for marriage. Before their arrest, they were on a mission to take additional briefing from the leadership of the terror group. The trio has been operating together as members of the intelligence team of the group. Their arrest has yielded information still being verified by security agencies.